Truly Design was born in Torino as a graffiti crew, pulling together Mauro149, Rems182, Ninja1 and Mach505. Sincere friendship and a strong passion for art have been the glue which has constantly held the four artists together for more than a decade. Artistic studies and the will to create a lifelong adventure out of passion soon led TD’s artistic research towards contamination with other art forms.The crewmates’ complementary skills gave birth to a cauldron of eclectic artwork. The crew soon became a breeding ground for ideas which pushed the traditional boundaries of graffiti art, developing the collaboration to the point of opening of a visual communication studio in hometown Turin. They involve themselves in street art, illustration, fine art, graphic design, and even teaching. Truly Design creates murals of various images and designs. Among these, they are specialized in anamorphic murals, only recognizable from one very specific vantage point. From that specific perspective the mural seems to float as a two dimensional image in mid-air. From any other perspective, though, the mural appears to be a warped mess. In 2007, the group founded Truly Design Visual Communication Studio, specializing in urban art, illustration and graphic design for commercial and artistic projects, working for several brands such as Fiat Group, Martini, Samsung, Nike and EMI. 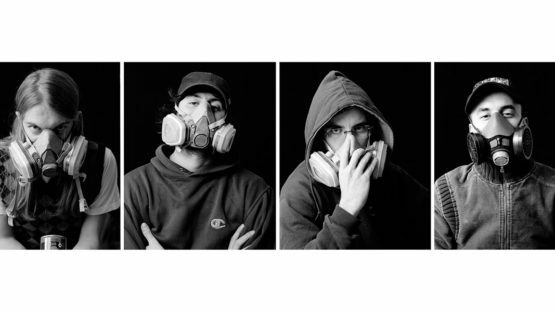 Their work has been published in international editions like Logo Design (Taschen), Logology (Victionary), Tangible (Gestalten), Graffiti Writing (Mondadori), Graffiti All Stars, Fefè, WeAr Magazine, and has been showcased in collective exhibitions (Italy, Germany, Belgium, Holland, Switzerland,France) and solo shows (Italy, Austria, Germany) and at the 54° Biennale di Venezia.